(The following article appeared in the Farrell Golden Jubilee Souvenir Program 1901-1951. Farrell, as the center of industry in the Shenango Valley, has grown through the years, with the interest of its inhabitants concentrated on the manufacture of various kinds of steel. Since the birth of the first steel mill in Farrell, the processes of making steel have changed many times. The mills of Farrell, however, have kept pace with these changes, and, at all times, have maintained the most efficient and modern equipment available to handle these changes. It is interesting to note that Farrell lies in the heart of the Shenango River Valley. The river is important to Farrell for it is one of the sources of water needed for the operation of the mills of Farrell. It is almost impossible to make a study of the development of the steel industry without emphasizing the importance of the coal industry, because each played an integral part in the development of the other. In the early history of the steel industry, coal was used in the blast furnaces, which themselves were in an experimental stage. Later, the Shenango Valley laid claims to many successful experiments with coal and ore which furthered the development of the iron and steel industry. The rise of the iron and steel industry, and the establishment of towns and cities in the Shenango Valley were outgrowths of the large-scale production of coal. All around the Valley lay coal veins which supplied the mills with essential fuel, low in quality, but rich for the purpose for which it was used. Coal was the product upon which the Valley built its industrial leadership. Its supply of coal and the introduction of transportation in the middle of the last century soon caused the Shenango Valley to rival Allegheny County as the steel producing center of Pennsylvania. The first blast furnace of the Shenango Valley, the Clay Furnace (named in honor of Henry Clay), was built by Vincent Himrod in 1845, on a site about a mile north of Sharon. It was charcoal in type, and modern for its time. The furnaces of this period were constructed of large stones, some of them weighing as much as a ton. They were built into the sides of hills, and tapered from about twenty feet square at the base to about ten feet square at the top. The top of the furnace was connected with the adjoining hill by a covered bridge, commonly known as the Bridge House. The materials for the furnaces were brought up the sides of the hill and were stored in the Bridge House, where there was always kept available a supply of ore and coal. This reserve was necessary to keep the furnaces in continual operation, for once the furnaces cooled, much time and money were required to bring them into production again. The blowers used in this early period were clumsily constructed, with the blast being either not hot enough or under insufficient pressure. Frank Allen, the manager of the Clay Furnace, at the time, developed the idea of diverting the gas from the top of the furnace to the base of the stack. A blast, considered quite powerful, was then produced to a pressure of about three pounds per square inch. The Clay Furnace holds the distinction of being the first furnace in the world to use successfully the Lake Superior ore, or Mesabi ore, as it is commonly known. Mr. Allen experimented with this ore and native coal until finally the Clay Furnace was using the purer imported ore with native raw coal. It was the first time in history that such raw coal was combined with imported ore for use in blast furnaces. About 1846 the first rolling mill in the Valley was built by General Curtis, a coal dealer, who was interested in setting up an iron foundry near some coal beds which he owned. He contacted several men from Pittsburgh, but because they could not agree among themselves on business terms for the foundry, the Pittsburghers decided to build a plant of their own. Eventually Curtis did persuade them to join in his venture, and they built a foundry. This foundry was later changed to a rolling mill, and the addition of this mill definitely established the Shenango Valley as an iron and steel center. Between the years 1856 and 1857 many types of furnaces were introduced to the Shenango Valley. These were the types built on level ground, using hoisting machines to carry the ore to the top of the furnaces. A steam ore crusher was also innovated, which did away with the old method of roasting the ore before it was put into the furnace. The new method greatly increased the output of iron. A furnace introduced to the Valley by Mr. E. A. Wheeler of West Middlesex, to a certain extent resembled the blast furnace of today. This furnace was called the Fanny Furnace, perhaps better known as the wonder of the times because it was the first really large furnace to be built in this vicinity. It was in every way the best furnace the Valley had until the modern blast furnace came into being. This period of iron and steel expansion saw four furnaces built in Wheatland, all manufacturing T rails for the Northern Pacific and Texas Pacific Railroads. The James Wood Sons and Company, the firm responsible for these mills, was very sound financially for a number of years, but the famous panic of 1873 combined with the use of Gessemer Steel for rails instead of the old iron rails eventually forced the Wood Company out of business. Until 1875 the blast furnaces of the district increased in number. During the last quarter of the century, however, there was a sharp decline, and by 1887 the number of furnaces in use had dropped from thirty to seventeen. Of the companies responsible for the growth of the iron and steel industry in the Shenango Valley, the most important and the longest surviving was the Sharon Iron Company, the owner of the old Clay Furnace. It is true that it ceased operations at the beginning of the 20th Century, but it was the foundation for the future growth of the iron and steel industries. Many of the men who were affiliated with this company have gained local as well as national recognition for their contributions to the processes of steel manufacture. Among these men were Christian H. Buhl and his son Frank. In 1862 Christian H. Buhl became owner of the plant, and Frank became the general manager. From this and other holdings, the Buhls formed the Sharon Steel Castings Company in 1887. This was the first steel producing plant in the Valley, as well as in Mercer County. In 1902 the company became associated with the American Steel Foundaries. Its plant has since been dismantled, and the site is now occupied by the Mercer Tube Works. In the year 1890, when steel began to replace the use of puddled iron, a change in manufacturing methods became necessary. This change, however, served to advance the Shenango Valley as a steel center, and resulted in greater developemnts in the new industry. The Buhls were responsible for bringing two other plants into the Shenango Valley, the Buhl Steel Company of Sharon in 1896, and a much larger plant located one mile south of Sharon, on the bottom land, in 1899. The Buhl Steel Company and the property of the Sharon Iron Company, Ltd., locally called the North Works,, passed into the hands of the Carnegie Steel Corporation, while the Sharon Steel Company, locally referred to as the South Works, became a part of the Union Steel Company on December 1, 1902. This plant later was known as the Farrell Works of the Carnegie Steel Corporation. Because the mills were located along the river, it was natural that the workers would want to settle in towns nearby, thus Sharon and South Sharon grew and developed into sizeable communities. Both cities can point to Frank A. Buhl for making Shenango Valley, practically single-handed, an iron and steel center. As soon as the Sharon Steel Company became established on the banks of the river just south of Sharon, hundreds of houses were built in this area, and in a short time a town of several thousand inhabitants had sprung up. This town was named Farrell in honor of James A. Farrell, the president of the United States Steel Corporation. The settlement of Farrell can be compared with the early settlements in the West during the gold rush. There was such a heavy influx of heterogeneous groups of peoples into the village that it attained a growth that for rapidity surpasses the record of any city in the country. Farrell although born without any particular pioneer history, had a romantic development which was peculiarly its own. Since 1901 periodic unsuccessful attempts have been made to merge Farrell with Sharon, but Farrell consistently preferred to remain an individual borough, finally a city. With the Carnegie-Illinois working at full capacity producing bar plates, the American Steel and Tin Plate Company and the American Steel and Wire Company, quick to realize the advantages of being near the source of bar plate output, in 1900 established themselves in close proximity to the Carnegie, and converted the Carnegie products into sheet steel, tin plate, and wire, respectively. These firms were added milestones to the progress of Farrell. Since the American Sheet and Tin Plate Company, the Carnegie, and the American Steel and Wire Company were now the mainstays if industry in Farrell, we should note some of the high points of their history. The original furnaces produced the first pig iron on December 9, 1901. Six years later, on June 9, 1907, seven open hearth furnaces were added, and nine years later, on March 21, 1916, three more were added. The first rolling mills began their operations on May 10, 1901, and the first open hearth was made on April 30, 1901. The original bar and billet mill was replaced by the present mill in March, 1918. The Carnegie works used two blast furnaces with daily capacities of 650 and 750 gross tons respectively. The height of these furnaces from the floor of the platform was 100 feet, and they were served by two blowers, approximately 5040 horsepower strong, which delivered a blast of 50,000 cubic feet of air per minute, at a pressure of 20 pounds. The total yearly capacity of these two furnaces was 482,000 gross tons of steel, and even today, fifty years later, the yearly tonnage has not changed. It is interesting to know that to produce the 482,000 gross tons of steel each year, 960,000 tons of ore, 195,000 tons of limestone, 420,000 tons of coke, and 1,600,000 tons of air are required. The ore used in the furnaces came from the Minnesota Ore Mines, and was shipped to Farrell by lake boats and railraods. The coke came from the Carnegie-Illinois Steel Corporation of Clairton, Pennsylvania, and the limestone from Hillsville, Pennsylvania. Today there is under serious consideration a continuous belt system which will link the lake port of Lorain, Ohio with the industrial area of the Valley. The product of the blast furnace, pig iron, is so called because of the odd shape acquired as the molten metal sets and cools in sand pits made for the purpose. The pig iron is subjected to a refining process, from which it emerges in the form of ingots. The ingots pass through various departments, such as the open hearth, where they are refined further, and the rolling mill, where they are reduced, rolled, and sheared into required lenghts. The sizes vary from 8-,10-, and 12-inches in width to 30 feet in length. The annual capacity of the rolling mill is about 420,000 gross tons, and the product is classified as semi-finished. The tin and sheet bar is delivered to various tin and sheet mills as a source of steel required for the manufacture of cans, bottle tops, kitchen utensils, enameled ware, toys, sign stock, and similar products. It is also used in auto body sheets, metallic furniture, radio and refrigerator stock, metal lath, steel drums, galvanized and other coataed sheets for the manufacture of garbage and ash cans, coal and water buckets, and flat, corrugated and formed sheets for the building trades. The Carnegie, the American Steel and Wire Company, and the American Sheet and Tin Plate Company were built close together, so that the products of one could be shipped to and used easily as stock by the others. The Carnegie sent its steel bars to the American Sheet and Tin Plate Company, where it was further processed and made into tin sheets and plain sheets for the items listed. Other kinds of steel were sent to the American Steel and Wire Company, where it was processed and made into wire and nails.
. On November 1, 1935, the plants of the American Sheet and Tin Plate Company and the Carnegie plant becaue a unit of the Carnegie-Illinois Steel Corporation, and two years later, in 1937, the Carnegie-Illinois Steel Corporation became part of the United States Steel Corporation. The American Steel and Wire Company continued to operate until 1937-1938, when it was closed and later dismantled, and the equipment shipped to a firm in Cleveland, Ohio. An important factor in the development of Farrell as an industrial center, one which cannot be neglected, is the Pymatuning Dam project, an undertaking jointly sponsored by the states of Pennsylvania and Ohio, for the purpose of conserving the surplus waters of the Shenango River to provide sufficient water for domestic and sanitary uses, and to maintain a constant flow of water for industrial use in times of drought. Many times the flood gates have been opened when the water in the river was running too low to satisfy the needs of the mills. By opening the flood gates, materials were saved and men were permitted to continue thir work. The 1700-foot dam is located one mile north of Jamestown, Pennsylvania, and twenty-five miles north of Farrell and Sharon, whose mills it supplies with water. Its construction was started on September 8, 1931, and was completed on January 23, 1934, at a total cost of $3,750,000. In the same year that the American Steel and Wire Company and the American Sheet and Tin Plate Company organized to buy and use the products of the Carnegie Plant, the Sharon Steel Hoop Company came into being. this company was organized by Morris Bachman, and was incorporated on Octover 8, 1900. The new company proceeded immediately to purchase a site of land along the Shenango River, south of Sharon, and started an 8 and 9 hot mill to roll cooperage hoop, cotton ties, and narrow steel bands. The location of the Sharon Steel Hoop Company being immediately adjacent to the Sharon Steel Company, later the Farrell Works of the Carnegie Steel Company, made it feasible for the new company to purchase its requirements of simi-finished steel from the mill located so near. When the original Sharon Steel Company was acquired later by the United States Steel Corporation, and a new contract for billets could not be negotiated, it became necessary for the Sharon Steel Hoop Company to produce its own open hearth steel. Thus, in 1902, the Steel Hoop inaugurated a building program which included four 35-ton open hearth furnaces, a blooming mill, and a bar mill on which billets would be rolled to be converted into bands on the 8 and 9 mills. In 1905, a fifth open hearth furnace was added, and a 10 hot strip mill was brought into production, In 1906, the company built and operated the first continuous pickling and galvanizing unit ever built in this country. During Mr. Bachman's term as president, the company earned a favorable reputation as a producer of cooperage hoop, and established connections with customers,who, fifty yars later, are still buying this same type of material from the Sharon Steel Corporation. The death of Mr. Bachman, which occurred in 1910, was a serious shock to the organization, and his friends, as well as to those who were connected with the company. The successor to Mr. Bachman was Mr. Severn P. Ker, who had many years of experience in the commercial side of the steel industry. Under Mr. Ker's direction, the company continued to increase its capacity and to extend its operations. In 1910, a sixth open hearth furnace was built, and a 14 band mill was added to the production line. In 1913, another open hearth furnace and certain auxiliary equipment were added, which raised the annual capacity of the company to 180,000 tons of open hearth ingots. 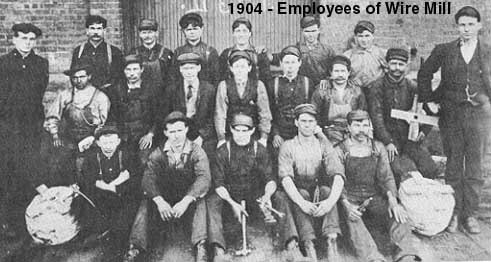 In 1917 the Sharon Steel Hoop Company expanded by buying the Youngstown Iron and Steel Company, with a steel plant at Lowellville, and sheet mills in Youngstown. The newly purchased Lowellville Works was equipped with four open hearths, several soaking pits, a blooming mill, and bar mill, and the Youngstown Plant with eight sheet mills, a jobbing mill, and a 72 plate mill. The Sharon Steel Hoop Company also acquired the Mary Furnace from the Ohio Iron and Steel Company to secure a source of pig iron supply for the Lowellville Plant, and added to the Mary Plant two new open hearth furnaces, a 34 reversing blooming mill, and a 21&$#148; bar mill, These improvements made it possible to abandon the now obsolete steel making facilities and blooming mill at the Sharon Works in 1920. To convert some of its material into fabricated products, the Youngstown Pressed Steel Company was organized as a subsidiary of the Sharon Steel Hoop Company in Novemer, 1917. This company operated departments at Youngstown and Sharon until it was moved to Warren, Ohio, where it carried on a general stamping business throughout the succeeding years. So that the Sharon Steel Hoop Company might improve its practice and be more competitive in the field of Hot rolled bands, a new continuous two-high hot strip was built during 1928 and, at the same time, construction was started on a new cold roll plant in the Sharon Works. Being aware of the need to diversify the products of the company, management started the development and initial production of stainless steel late in 1930. The stock market crash in 1929. combined with the sharp reduction in sales and operations, and the heavy investment previously made in new equipment, left the company to face the years of depression seriously short of capital to carry on the business. About this time, Mr. Ker retired as president, and in December, 1930, Mr. Henry A. Roemer was elected as the third president of the Sharon Steel Hoop Company. Mr. Roemer accepted his position as president of the Sharon Steel Hoop Company with a background which any steel mill official might envy. He knew the work associated with steel production from the workman's point of view, and he knew leadership from the administration's point of view, having served capably as superintendent of several steel companies. In the early years of the depression, things were difficult for the new president of the company. Orders were hard to secure, the operating rate was low, money was scarce, the bond interest had to be paid in scrip, and the equipment needed to be modernized. The new continuous hot mill built in 1928 needed to be remodeled, widened, and converted into a four-high strip mill, also new cold rolling facilities and equipment for stainless steel production were needed. Numerous other problems showed up which the management had to face. However, Mr. Roemer and his organization tackled the problem of rehabilitation and rejuvenation, with the result that the Sharon Steel Hoop Company under Mr. Roemer's leadership not only survived the depression, but had been built up and expanded tremendously. The first no-direct-contact continuous process for the electrolytic pickling of stainless steel and degreasing and cleaning cold roll steel prior to coating was placed in operation at the Sharon Steel Hoop Corporation in 1933. Aided by improvement in business conditions, the Sharon Steel continued to expand its sales volume and to make further improvements in production facilities during the thirties. Equipment for the production of terne and tin coating was added, a new product under the trade name of Galvanite was produced, and other specialties were added to the company's line of products. New electric furnaces were installed at the Lowellville Works to make stainless steel ingots to be converted into stainless steel stip on the Sharon finishing mills. With the attack on Pearl Harbor and the declaration of World War II, the Sharon Steel Corporation, already actively engaged in the production of high carbon steel, various alloy steels, stainless steel, a variety of coated products, and other elements important to the war effort, became one of the leading producers of helmet steel, flak curtain and aircraft armor steels, bullet core steel, and other steel products used in almost every branch of the service. The organization established an enviable record for performance and service to the government in time of war. In this time of stress, new production records were established, and the company went through the entire period of the war without a slowdown, sitdown, shutdown, or strike. Immediately after the war, the Sharon Steel Corporation resumed its long-range program of development and expansion. On April 1, 1945, Mr. Henry Roemer arranged to purchase the Detroit Seamless Steel Tubes Company, a seamless tube producer of Detroit. On November 9, 1945, Mr. Roemer concluded his negotiations with the Carnegie-Illinois Steel Company for the purchase of their Farrell Works, a steel producing property located immediately adjacent to the finishing mills of the company at Sharon. 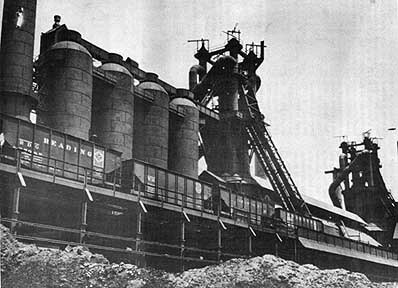 This new property included two 900-ton blast furnaces with ore handling equipment, sintering plants, and other facilities necessary to the production of approximately 560,000 tons of ingots, a 36 blooming mill, 24 and 18 bar mills, together with excellent shop facilities for maintenance; a complete railroad system with all equipment, and the very large plant known as the Farrell Ordnance Works, all of which have added greatly to the capacity and ability of Sharon Steel to produce steel at lower costs. Early in 1946 the Sharon Steel Corporation expanded further by concluding a lease with the United States government for a byproduct coke plant located at Morgantown, West Virninia, and in October of the same year by the purchase of the Bopp Steel Corporation and its subsidiary Steel Trucking, Inc., located at Dearburn, Michigan. In December, 1946, the company acquired the Brainard Steel Corporation of Warren, Ohio, an important producer of cold roll steel, electro-galvanizing products, welded steel tubing, and the famous Brainard steel strapping. This plant has an annual capacity of 85,000 tons of specialty steel products. In January, 1947, Sharonsteel Products Company of Michigan had established a steel warehouse in Detroit. This action was followed in August, 1947, with the organization of a similar warehouse in Farrell, Pennsylvania, known as the Sharonsteel Products Company. (The above article appeared in the Farrell Golden Jubilee Souvenir Program 1901-1951.